3… 2… 1… drill! Who would have thought that drilling could be so exciting. 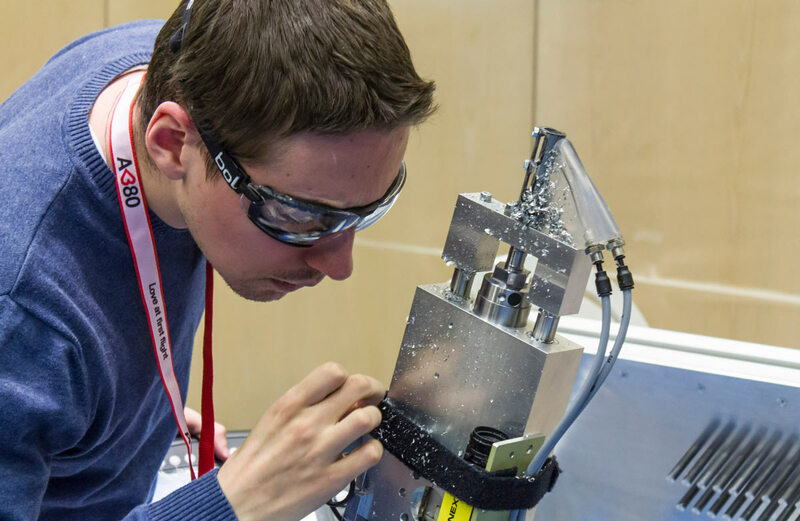 At the Airbus Shopfloor Challenge last week in Stockholm, 7 teams from around the world competed over 4 rounds of intense drilling. The event was part of the annual International Conference on Robotics and Automation. The goal of the competition was to build a robot that could drill as many holes as possible in one hour, in the right position, and with the right diameter. Robots were required to be light, modular, and open. In what turned out to be a suspense-loaded two days, spectators saw the whole gamut of emotions driven by catastrophic failures, live coding of new solutions, sheer joy when the drills powered through, and the exhaustion of pulling all-nighters to compete in what was a very tight race. Above all, it was a chance to see teamwork, innovation, and creativity in action. All the solutions and approaches were profoundly different, and many of them worked really well, although not perfectly. That gave rise to an ideal level of competition: the task was hard enough that no one was perfectly good at it, but it was feasible and teams were able to finish 1-hour rounds with a nicely drilled panel. It was also exciting to see a mix of self-taught undergraduate students battling out against semi-professional teams. Turns out, the pros didn’t win, everyone loves an underdog. The first day started with a demo round to check that everyone could drill. Team Bug Eaters from the University of Nebraska-Lincoln was the first to leave the competition. After days of hard work, and what turned out to be an excellent learning experience, their robot just couldn’t drill. They were one of two teams employing a delta-based design for their platform. The theory was that the delta would be more light-weight, and precise – which everyone agreed was a promising solution. It’s also a riskier approach, and the time to fully implement the robot was just too short. Team Akita from Japan, using the other delta-based robot, was not able to drill either because the arms weren’t stiff enough to carry the payload. Their setup was absolutely impressive however, and everyone was treated to a live demonstration of their massively extending arms at the end of the competition. This is probably the only robot of the lot that could realistically reach many areas in an aircraft. With two teams out of the official competition, 5 were left standing for the first official round of the competition. This was a lucky coincidence as there were really only 5 drilling stations available at the venue. 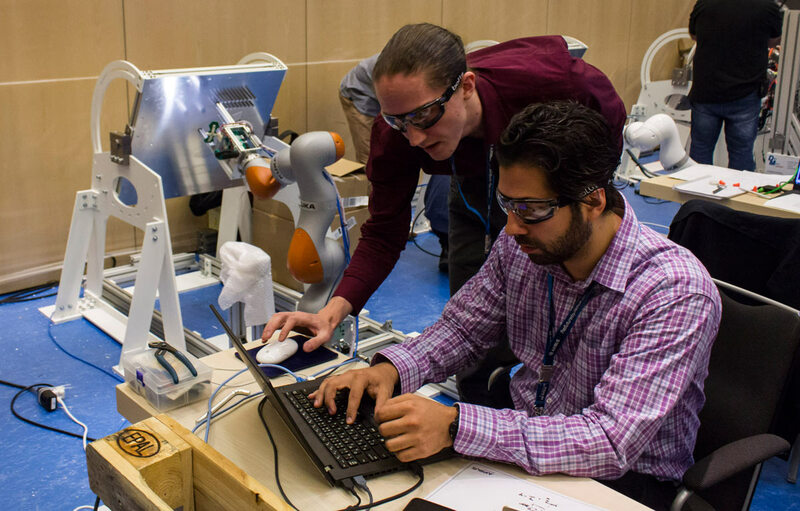 Imagine setting up drilling robots in a hotel room… quite tricky indeed. All the remaining teams based their robots on custom-made XY platforms or commercial robot arms from Denso or Kuka. After the first whistle blow, everyone was silent, waiting for the drilling to begin. It is a race after all! They had to wait a bit longer however as the robots spent the first couple minutes calibrating and figuring out where the panel was so they could drill in the right place. For sensing, teams used a variety of vision systems combined with light patterns or lasers. One by one, they started drilling. Team Vayu was quick to drill, since they had a simpler calibration strategy which was only based on one of the reference holes, instead of the three available. Their control was open-loop, meaning they had no way of checking that they were drilling in the right place, and correcting. After drilling a series of holes, the drill broke, leaving them in a hurry to replace the bit. CriGroup had to do their calibration a couple times before they were ready to start drilling. Once moving, their arm performed beautiful kinematics to go to the different positions in their schedule. They were the only team to drill in an order that seemed completely random. 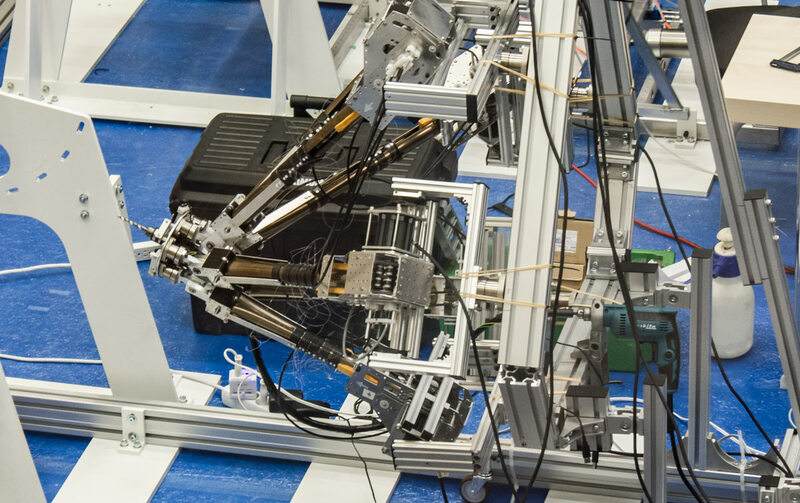 Instead of drilling holes one after the other in a line, they used a traveling sales man algorithm to minimize how much they needed to move the joints of their robot arm. Team Sirado, and team Naist seemed on track with their sophisticated drilling heads. Sirado’s driller could even sprinkle lubricant and blow away debris as it was drilling. 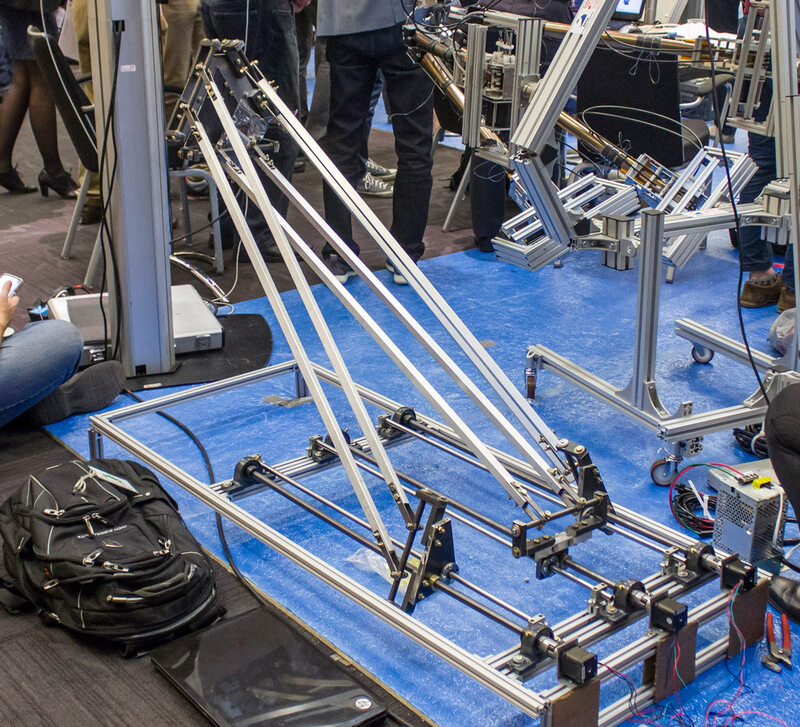 Team R3, a robotics collective based out of Ryerson University in Ontario, Canada, thought they would outpace everyone with their 7-bit drill XY system. But their robot never really started drilling. An electrical problem seemed to get the best of them that round, it can be a very long hour when things go wrong. Remarkably, the teams were continuously improving their approaches, even in the middle of a round. At one point, CriGroup decided to drill the constrained holes, which are in areas that are obstructed by pegs on the panel. About a millimeter before a crash with the panel, their operator pressed the emergency stop, something was wrong with the code, they had to reset the system. At the end of the first round, the judges took the panels and started scoring them one by one. 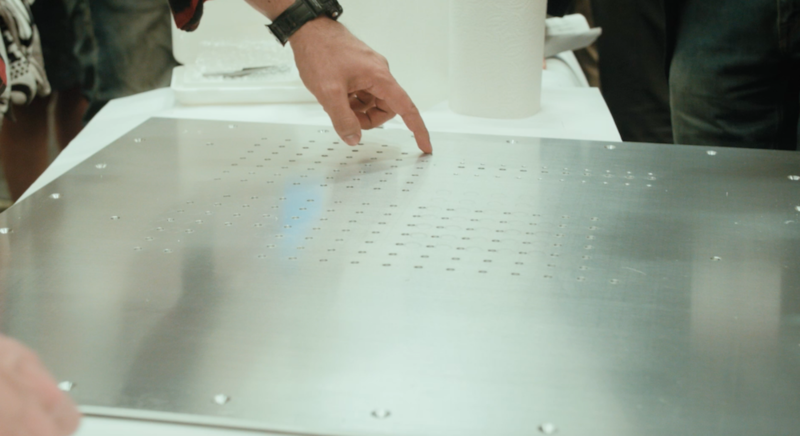 This turned out to be a tedious task as each hole needed to be checked for location, precision, and diameter with the help of a perfectly drilled reference panel. A score card was filled and cross-checked. With each panel having up to 255 holes, the judges ended up spending over an hour converging on a good scoring technique. The panel of team Sirado, which seemed nicely hole-ridden and ready to score big, ended up being misaligned due to a shift in calibration. They weren’t the only team with holes in the wrong place. The judging was strict to replicate conditions on an actual shopfloor. The reality is, only perfect holes make sense for aircraft production. 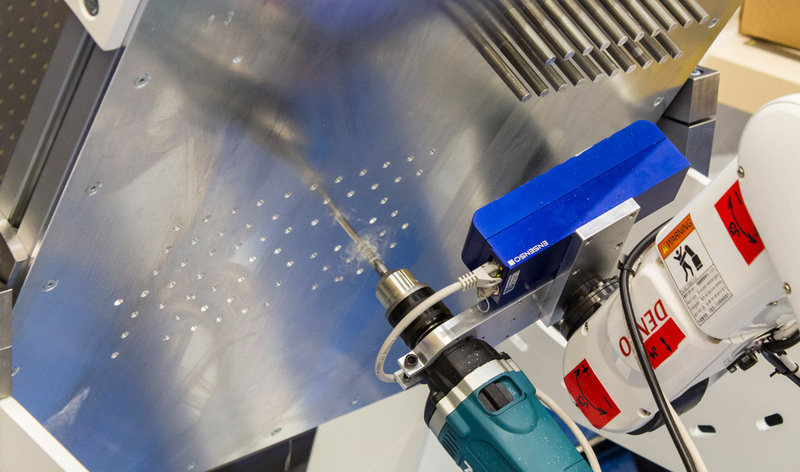 And that was the key message after round one – fast drilling without precision is useless. So the teams went back to the drawing board for the night. By the morning, team Vayu had figured out how to reduce vibrations, so that the drill wouldn’t break, team R3 fixed their electrical problem, and everyone worked on better calibration. To make things more difficult, panels were tilted 30 degrees. Team R3 hit the ground running, their drilling of 7 holes in parallel looked like it was going to obliterate the panel in no time. Vayu, after performing even better than in the first round, encountered a new technical problem. One of their cables was a tad too short and got disconnected, but they fixed that too. Team Naist was having trouble drilling due to a software problem. Something was wrong with the positioning of their holes, and they were continuously tweaking the code. There was also an issue with their three-finger solution slipping a bit. At the end of the 2nd round, it looked like teams that performed best in the 1st round were having trouble, and those that performed worst were catching up. So all in all, a very close race! Four teams were determined to be above the fray, R3, CriGroup, Sirado, and Naist. They were all given a chance to compete in the finals. Team Vayu didn’t quite reach the same level and finished the race then, which was already a tremendous achievement. They embarked on this challenge as 2nd year aerospace students from India working on their robots from 5pm to midnight in addition to completing all their coursework. They learned control on internet, and built a very clever and low-cost solution with motion controlled independently along 3 axes. Their lesson for next time: “we’d do closed-loop control, use three reference holes for calibration, and reduce vibrations”. After a few more tweaks to the code, the teams were ready to compete once again in the final round. At this point, it was really unclear who would win. The boards were tilted again 30 degrees in a different direction. This messed up the calibration system on team Sirado’s robot because of light reflections. As a result, they were forced to recalibrate their robot every couple lines of holes. Team Naist looked like they had everything under control, although it took them some time to get started. They were still coding throughout the round. 3 minutes before the end, their drill broke. One team member sprung into action, whipping out a new drill from a pocket, and installing it for a final push to the finish line. Team R3 had swapped their 7-tip driller for a 4-tip driller. The bell rang, everyone cheered, proud of the tremendous amount of work and time invested, and completely unaware of who was going to win. 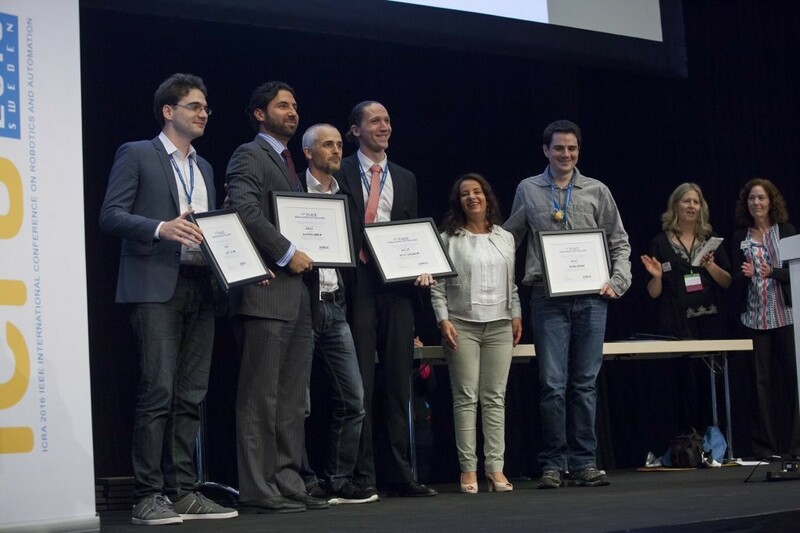 After more scoring and deliberation, the winners were announced at the conference award ceremony. R3 came in a close fourth place, very impressive for a team of undergraduate students. Team Sirado came in third, with their near professional solution and specialised drilling head. 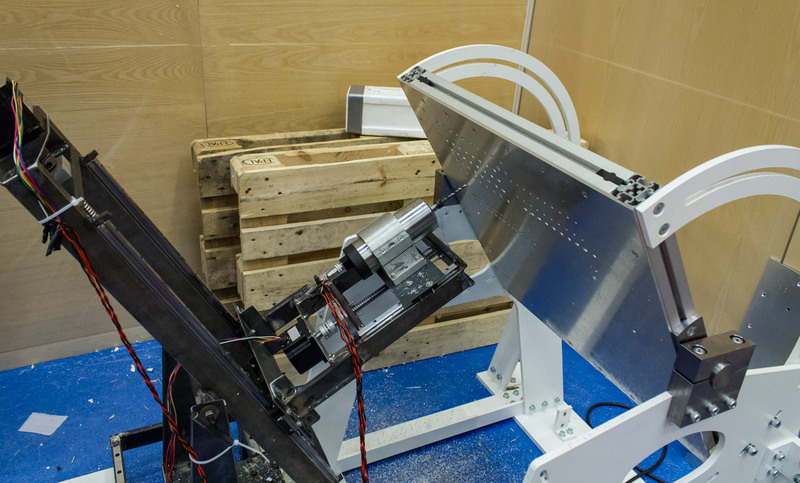 CriGroup, came in second, they proved to be quite reliable throughout the competition and had a good working solution that was modular, light-weight, and open. Team Naist came in first, quite a comeback, and a clear reward for their constant improvements throughout the competition. All in all, the competition was a great success. None of the solution were perfect, but combining the best of each could prove to be a helpful strategy on the shopfloor. Winning teams received up to €20K in prize and most important, an experience of a lifetime. They can all be proud of their tremendous accomplishments. 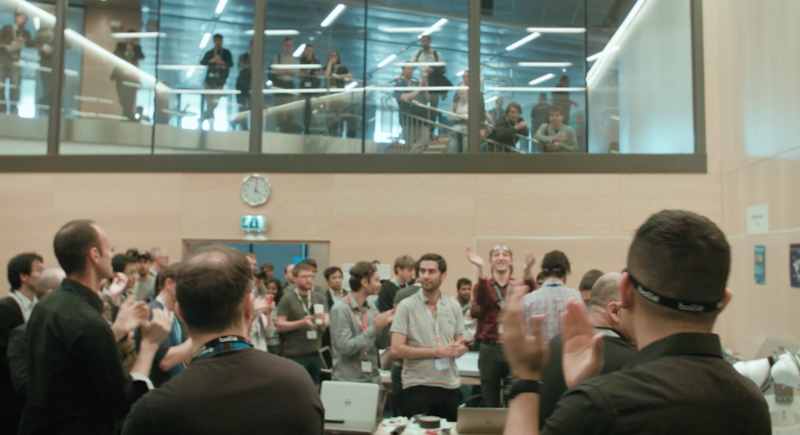 It was impressive to see all the team’s solutions evolve in real time, with each round bringing a new series of working solutions to a concrete real-world problem. You can also find our live coverage on twitter at #AirbusShopfloorChallenge or below.